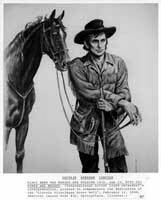 Description: This illustrates Lincoln as ranger and soldier during the Black Hawk War in 1832. Lincoln is depicted with his horse and musket. This positive was used to commemorate the dedication of the Lincoln Pilgrimage Honor Roll on February 12, 1988 at American Legion Post #32 in Springfield, Illinois, organized by Phil Wagner. *The back of the positive contains the hand written description of the subject with artist initials.